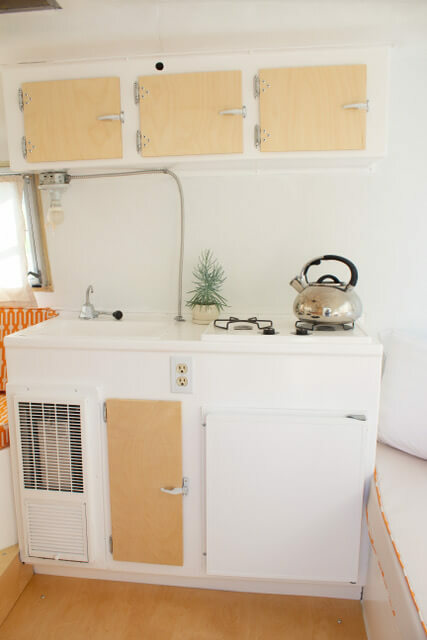 In a small camper, making the most of your space can be a challenge. 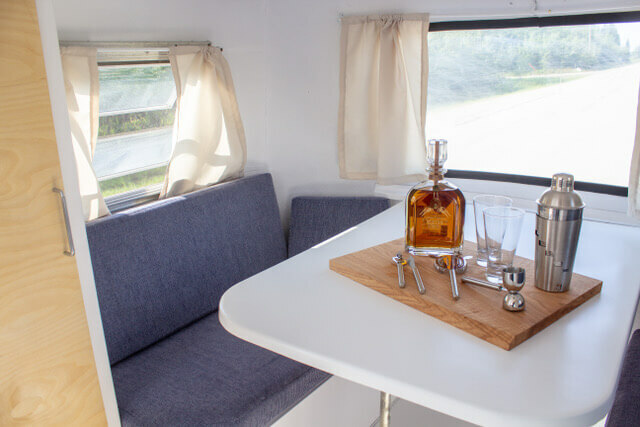 As experienced RVers and Boler renovators, we have a few tips to share! Storage solutions, colour choices and minimal décor will help you feel right at home in your tiny space. When it comes to organization, think about dual-purpose first and storage second. Try finding your shoes at 6am when the birds wake you up and they’re not where you left them. Your shoes got moved because everything that was stored on the table is now on the floor. Why? Because you’re now sleeping on the table. Nope, storage was not our friend (especially when I needed to pee)! Don’t get us wrong, what does work well is dual-function. As you can tell from the photos, our bed is also our living room and dining room on rainy days. But when it comes to storage, everything needs a home. Storage Solutions For the Win! So, how do you organize your storage? 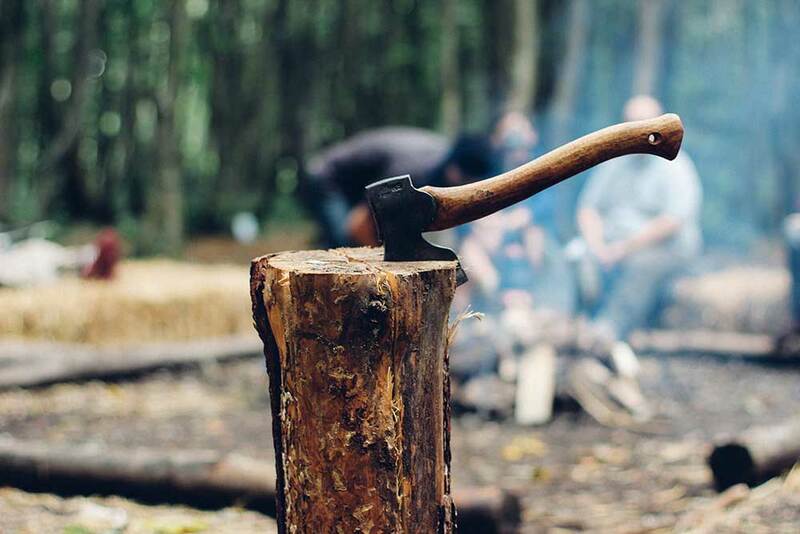 Know that it takes time and multiple camping trips to figure out what works best for you (it may even vary season to season). 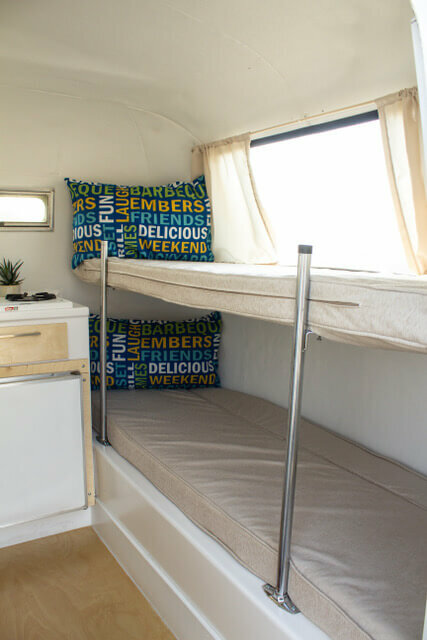 For us, in our 13-ft 1972 Boler, we make the frequently-used items both accessible and available. Take those shoes I can’t find, for example – they need to be tucked away, yet reachable. They need a permanent storage spot. 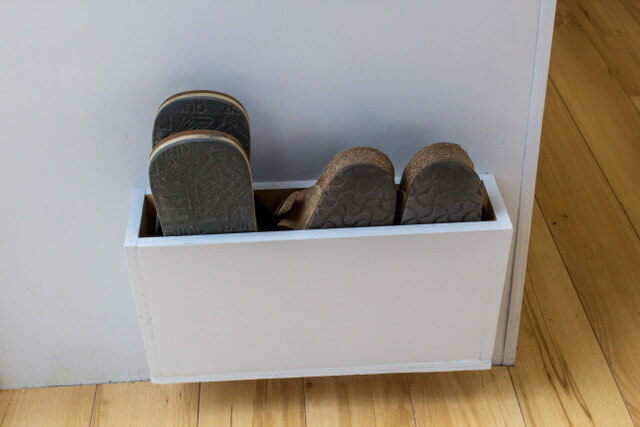 The shoe cubby in the photo below works perfectly for our needs. It helps keep grime off the floor and doesn’t take up too much space. 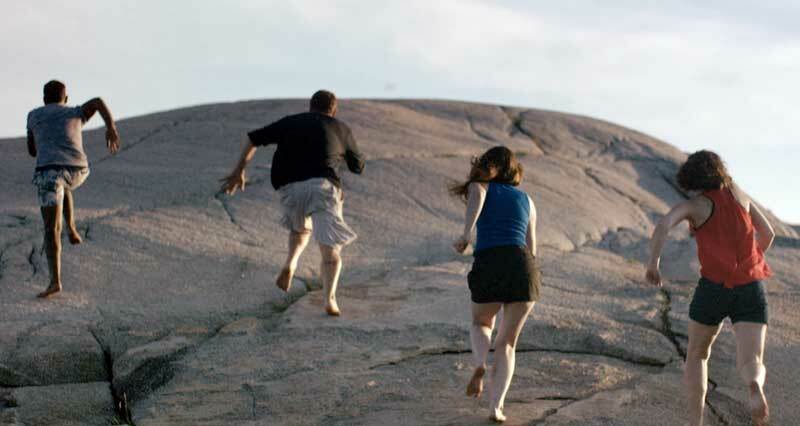 Plus, it makes finding shoes easy when I have to hustle to the washroom. For colour choices, we’re fans of a neutral palette with accents of colour. Not only does this give us the opportunity to switch things up easily, it also makes our space feel organized and inviting. Keeping the interior light and bright with white walls and tan curtains helps our space feel fresh and airy. 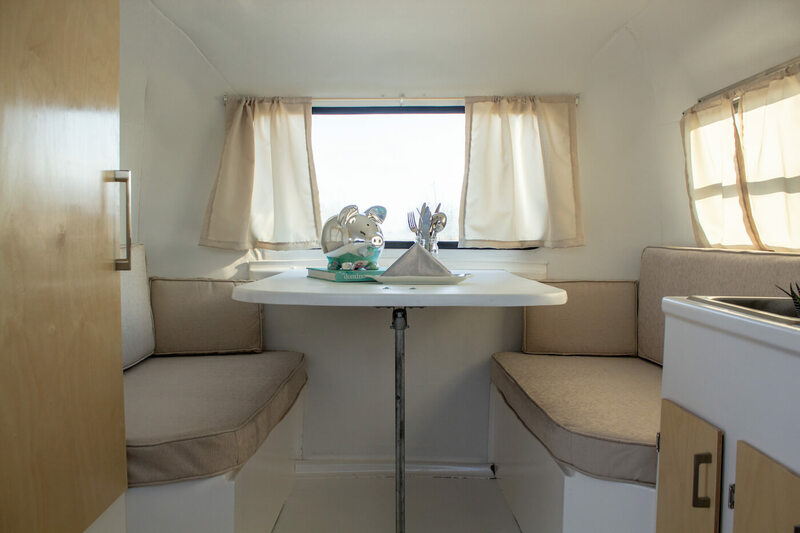 This way the 68-square feet of trailer awesomeness feels open, spacious and welcoming. A space that I want to hangout in! See the cushion fabric? It’s a high-quality and machine-washable microfiber with zip-off covers, making its sand colour less scary when it comes to stains. Light, neutral fabrics add an open feel. 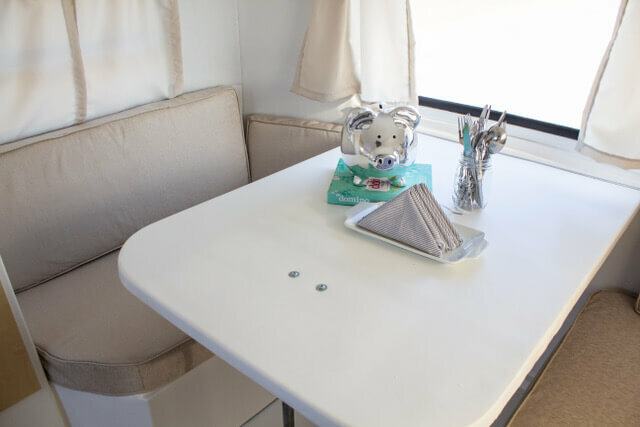 Another quick tip – carry a neutral fabric throughout the space as it will help to unify the camper, making it feel cohesive and spacious. Another way we maintain that open feeling is to keep the décor minimal in our space. Don’t get me wrong, we certainly inject our personality, but what we don’t do is crowd it with unnecessary items. 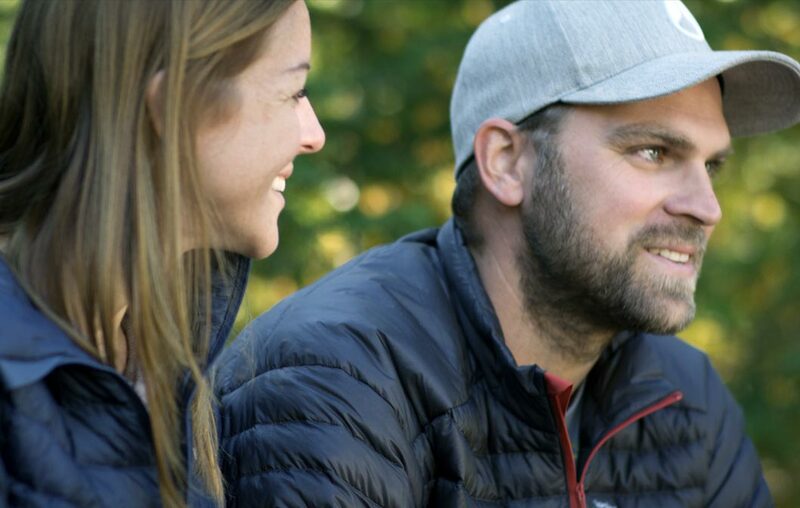 We look for a mix of purpose, functionality, and style. Take this kettle – its mirror finish helps to open the space up, however, it’s also great for morning tea. Look for items that can standalone, yet also complement other functional pieces, like this bar set. Well, there you have it – little tips to help you make the most of your indoor space. Thoughtful storage, colour and décor will help you balance functionality with personality and you’ll be camping in both comfort and style! 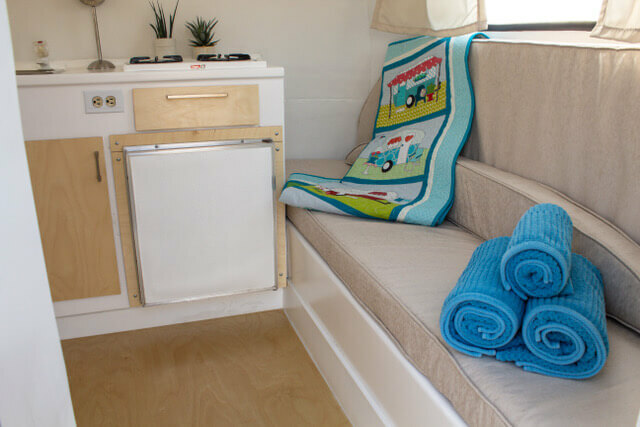 For more inspiration, check out these tips for vintage camper renos and simple ways to add a splash of brightness to your RV on the Go RVing Canada blog! Got a helpful hack for making the most of your space indoors? 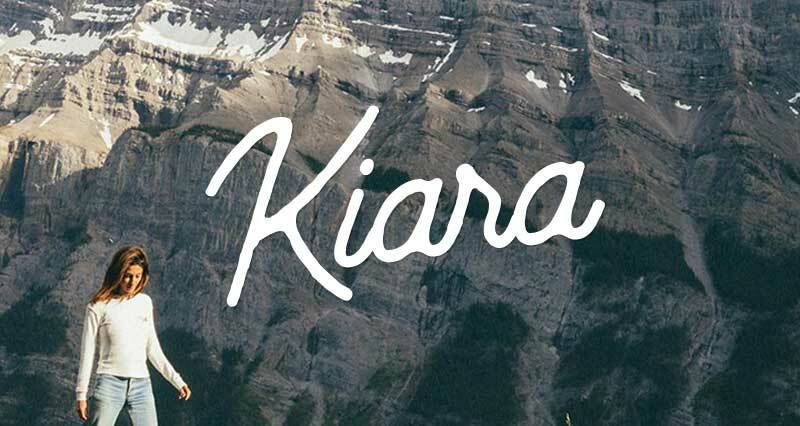 Join the Go RVing Canada community and chime in on Facebook, Twitter, Instagram and Instagram, and their blog.